CB radios have always been the fun tool when it comes to going on jeep trip with your homies. Whether you’ve decided to run your tires over coarse roads or sand-loathed grounds, CB radios are the best choice for communication. I have seen many times people confused about buying Jeep CB products. What are the confusions here? There are hundreds of CB radios available in the market, you just need to pick a product. NO NO NO! That’s not the case here. Since you’re buying the CB system particularly for your jeep, there are many things which have to be taken care of. All your queries will be answered in this article. We have you covered here through expert guides and reviews of those CB radios, antennas and mounts you should get for your Jeep. With all the fabulous features like ANL Switch, Squeal Control and SRF meter this highly durable and compact CB radio will be the best you can get for your Jeep Wrangler. 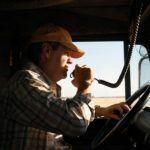 It is a hassle-free CB radio that will give you the clearest sound output even when you’re in the middle of a tedious trucking. 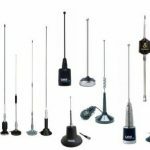 Click for Latest Price of Uniden PRO510XL A fiberglass CB Antenna, this will withstand all your rigorous road trips and will fetch you great reception quality. The highly durable antenna gives a listening range of 20-25 miles. What more? Yeah, it is coming from none other than FireStik itself. Click for Latest Price of FS-4RD Ready to install CB mount for jeep, this Rugged Ridge offers easy and convenient installation. What you will love the most about the efficiently crafted mount will be it’s 5 years limited warranty. The warranty itself speaks of the built quality of it. As I said above, selecting a CB equipment for Jeep is not that easy. You know why it is so! Jeeps are more prone to jerks while driving through uphills. This is the main reason why you need to select the CB equipment that can sustain these vibrations. 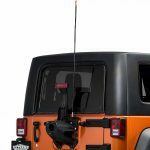 We’ve highlighted some qualities to look for before buying antennas and radios for your jeep. For CB radios, the main thing you need to keep under your radar is the compact nature of your radio because of space constraints. Look for radios that favor clean installation. Compact CB radios can provide you an uncluttered environment with their all-in-one units. For CB antennas for your jeep, you need to focus on two main things, length and physical structure. Jeeps are already huge and can also provide you high mounting surface. The best compatible antenna size for your jeep is about 3 to 4 feet. The 4 feet antennas provide you greater range and better quality of reception. Fiberglass antennas are best suitable for your jeeps because they can take a heavy beating and are not easily breakable. It would be better if you attach spring to it for erasing all risks. Let’s look at perfect CB radios and antenna that offer you adventurous experience with your jeep squad. It’s time to look at some of the best CB radios and antennas for a jeep. 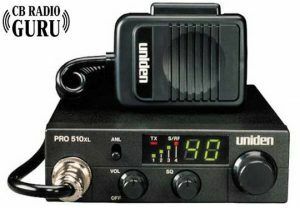 This radio comes under Uniden’s ‘Professional’ series. It is designed for places having space issues and votes for a neat installation. The radio covers all FCC legalized 40 AM frequencies. This radio has a front-positioned microphone with a suitable length for the cord, making you chat easily while sprawling over your back-seat. It utilizes Superheterodyne circuit, assuring you preciseness in frequency control. This is based on phase-locked loop technology. This radio guarantees enhanced reception with its built-in noise limiter. The ANL switch and squelch control block the noise and provide high-quality talking experience. These features enable blocking noise coming up from your jeep engines or other elements in the surrounding. With the presence of Signal/RF Meter, the signal level is enhanced by adjusting the gain. It also provides red-lit LED for easy ‘reading out’ in just a blink. You can easily glance at it while driving to perceive the reading value on the screen. This radio best compatible with jeeps and small spaces provides loud and clear sound output. Excellent price when paired up with the quality. This radio may seem a little too compact for some people. Cobra radios are famous and notable radio manufacturers in the market for Citizens Band Radios. This radio is manufactured to offer 10 NOAA weather channels along with 40 channels like other top CB radios. It not only provides good quality transmission but also enables CB enthusiasts to set these radios up and running for small spaces. This means it is perfect for your sheeny black jeeps as well. Your signal is less likely to be interfered by the unwanted background noise with its ‘sound tracker’ system. With its perfect compact nature, you can easily hold it in your hands. You can always access channel 9 or 19 that are featured with a dual watch and channel scan. It also supports ‘4-channel programmable memory locations’ feature. The Remote Mount System helps the easy installation of this radio to your jeep’s dashboard. The radio has illuminated display quality which helps you to read easily even in the dark. This jeep-supported radio is extensively voted for its easy installation and operation. You are less likely to receive a faint reception signal as this radio produces clear and loud sound. External speaker feature adds a star to this high-quality radio. The manufacturers of this radio limit the risk of theft and robbery by making it easy-to-detach product. You can safely park your jeep under the tree in disturbing areas, shoving your radio in your hand and satchel. This way you can restrict stealing of your newly bought radio. This radio demands safe placement of the base nearer to antenna cable of the CB radio. The is because the base of this radio consists of small cable connected to it which is attached to mic detachment connection. Your hunt for the best CB equipment to your jeep won’t end up with nice radios. You need a good CB antenna for jeep so that you get a better reception and proper communication. Since fiberglass antennas are most suitable for jeeps, this FS series Firestik 4ft antenna is perfect for its length and fiberglass chassis. Firestik antennas are the top-notch brand in CB industry. Not just longer antennas of this brand work smoothly, but also shorter antennas. This antenna requires ground plane which requires you to mount it on a metallic surface. Comes in four different colors, namely red, black, blue and white. It can endure wattage up to 900watts. This jeep CB antenna also supports duel setup. It comes with a tunable tip along with the cover, responsible for easy and perfect tuning. The reception quality of this product is great even though it is a little antenna. It comes tuned. You can get a range of 4-6 miles with this fiber-glass antenna. Even If you are drifting in bushy places, you can still encounter great reception and the listening range of 20-25 miles. It is massively strong in terms of durability. This can stand rigorously against all interceptions with branches in woods and along steeps. 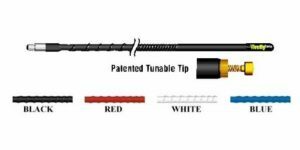 The tunable tip not only wins in getting great SWR, it offers easy installation and perfect versatility. You can remove or mount it easily on different vehicles. Since the jeeps go on tough trails, your antennas must bear a lot of bearing. This antenna though is strong, it does not come with studs and you are required to buy spring for it. 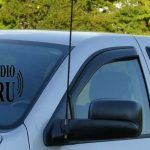 A good guide to buying good CB products for your jeep always mention best rated CB Antenna mounts. Without a good jeep CB radio mount, you will face a lot of troubles using the antenna and radio. 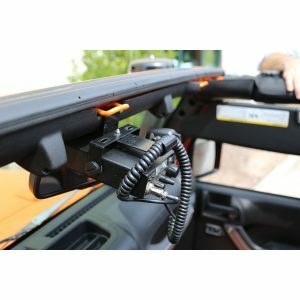 Here we have listed some of the best products you should check out as mounts for your CB radio in the jeep wrangler. [easyazon_link identifier=“B00FAREI1A” locale=“US” tag=”cbradioguru08-20″]Jeep Spare Tire[/easyazon_link]: This jeep jk CB mount offers heavy duty specifications. It is one of the best you can use if you are a frequent traveler. You can easily fit it behind the spare tire of your jeep, thus saving some precious space. That’s not the highlighting feature. You don’t need any drilling if you’re going to use this jeep jk CB antenna mount. Before buying the CB radio, always understand what you’re buying it for. For jeeps, buy compact radios and strong fiber-glass antennas that can bear many beatings. You need to buy good quality jeep CB mount. Otherwise, all those investments are not going to help you. So, try to get a rugged CB mount for your jeep wrangler. Yes, invest in the best we have listed above for the best experience in wild jeep trips.